CreativeMornings Edmonton - Shock | Pure Vision Inc.
CreativeMornings Edmonton has been on my radar for quite some time now so I was delighted when our two paths finally crossed. 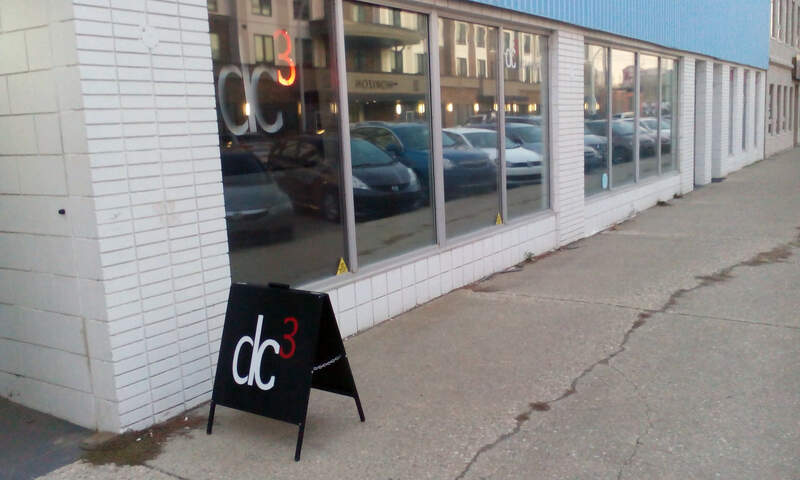 This month’s talk was by David Candler in his space at his contemporary art gallery dc3 Art Projects. The first thing that I noticed upon walking into David Candler’s dc3 Art Projects was the absolutely incredible space. Wow. It’s definitely a hidden gem in our sprawling urban metropolis. Brandon Webber has hosted CreativeMornings for the past 3 years and if I had gotten wind of how funny and witty and clever he was earlier I definitely wouldn’t have waited 3 years to visit his “Baby.” You can also find out more about CreativeMornings through their global (#CREATIVEMORNINGS), local (#CMEDM) and theme (#CMSHOCK) hashtags. It was apparent early on that David is involved in the art world for reasons that aren’t monetary. He actually started off in music and is a self described “band geek.” On the theme of SHOCK he spoke to having an overwhelming experience with a piece of art and the power of what creative things can do to people. Art pieces that truly stand the test of time and become important historical objects. Artifacts. The part of his talk that really struck me personally was when he posed this question: Do we have the ability to be shocked by art anymore? It was a valid question and one that I was able to answer a resounding “YES” to over and over and over again throughout the 60 minute talk. David worries that the power of art is decided by what is online and it’s a valid argument but one that won’t be won on his watch. He spoke with so much passion to the fact that contemporary artists have been working with SHOCK for a very long time. He also touched on an idea that I’ve struggled with. What exactly is art? Maybe the whitewashed pictures and ideas served to us by corporations and through the big box interior designing and decorating retail giants aren’t exactly art. To quote Mr. Candler, “…sometimes pretty art just becomes dressing on a wall…” “For art to have a lasting impact it should touch us somewhere other then just from the neck up.” So for something to be considered art it needs to touch us. It should make us FEEL SOMETHING… Something classified as art needs to stand up as these incredible cultural documents. Art needs to send you away with a passion or a feeling or a lust. We need to get away from the artifice and the superficial. These are all David’s words. This is the power that art can bring to peoples lives. As a collector he finds work that keeps him up at night that can connect with him and that he can go back to 50 or 100 times. Art should never be disconnected from emotion and David really spoke to this fact. “Oh. This is nice. This is pretty. I like this.” That’s not real. During his brief 60 minute journey through some of contemporary arts more SHOCKing moments we were really encouraged to examine why we feel a certain way and to ask what it is about me that these feelings come up when I’m confronted by these pieces of art. Why does this stay with me? Really arresting work may be easy to look at in a formal point of view but becomes something else and becomes SHOCKing when coupled with the experience. Damn. What a CreativeMorning! WHOO! All this AND A PAIR OF SOCKS?! (No. Seriously. Camper’s Village provided the almost 100 people in attendance with a pair of Smartwool Charley Harper socks from their Limited Edition Collection. Next month’s theme is WORK and you’re not going to be able to keep me away. Brandon Webber has created something really special in Edmonton by hosting the CreativeMornings concept here and I definitely look forward to making sure that my path crosses with David Candlers again very soon. If you’ve yet to attend a CreativeMornings, just what are you waiting for?! They’re AWESOME! Go go go. Be inspired. Mingle with other creatives who make this City great!